The Velvet Life - Page 69 of 130 - Musings of a Beauty Addict! Guerlain L’Or Radiance Concentrate with Pure Gold is a complexion-perfecting primer infused with pure gold flakes. As described on the official website, Guerlain l’Or is an embellishing make-up base sprinkled with pure 24-carat gold flakes. Like the most luxurious jewelry pieces, the precious flakes were crafted into ultra-sparkling and ultra-reflective particles, then dispersed in a hydrating smoothing gel. The complexion is beautified. It glows with divine and unfailing radiance. Skin is smooth, supple and satiny, ready for perfect, enhanced and long-lasting make-up. 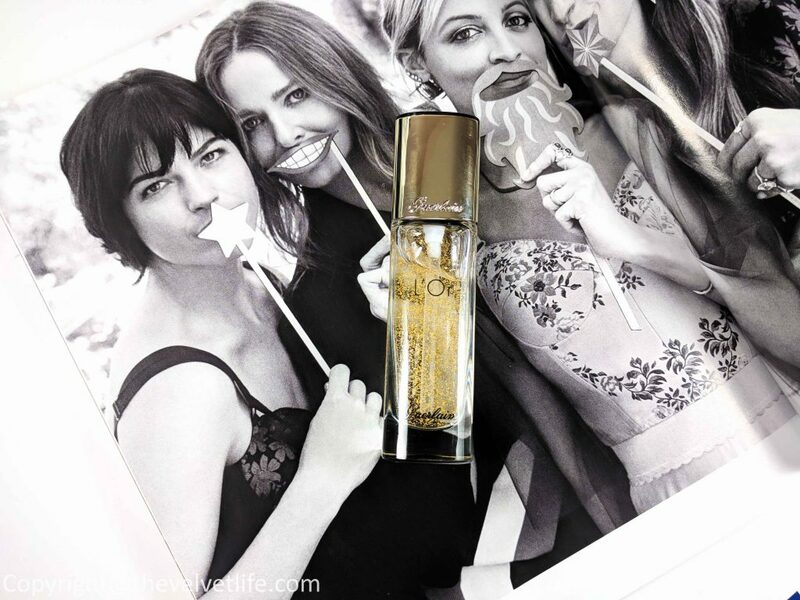 So here are my thoughts about Guerlain L’Or Radiance Concentrate with Pure Gold. Starting with the packaging, it is housed in a heavy glass bottle with a pump dispenser. The bottle and the cap both have the name Guerlain over them. If you look at the pictures and in person, you see the gold flakes in the bottle floating in the liquid product. The texture of the product is gel-like and feels very light when dispensed. I take one pump of the product on the fingers and then apply it straight to my face. The gold flakes dissolve while I apply it onto the skin. The product does not take much time to dry the skin due to its lightweight and the result is hydrated radiant skin. I apply this primer to my foundation or tinted moisturizer. It has been a savior for my skin in this weather, the skin looks plump, no signs of my dehydrated skin and no breakouts or irritations for my acne prone combination skin. The foundation stays on well over this primer and never experienced the makeup rolling off. I have used it on the days when I am not wearing makeup, it gives a beautiful glow to the skin and makes the skin look hydrated, youthful, and radiant. It does not emphasize my pores or imperfections. I use it with my Guerlain Lingerie de Peau SPF20 Foundation which I reviewed here. I have used it with other foundations I have and it works very well with all of them. Overall, I am really satisfied with this primer and has been loving this in my daily routine. Guerlain L’Or Radiance Concentrate with Pure Gold is available at Sephora Canada, Hudson’s Bay. *DISCLAIMER – This is a press sample sent to ‘The Velvet Life’, all views and opinions are 100% honest and based purely on my own experience. La Mer has been known for their luxurious formulas, healing power, miracle broth, effectiveness, luminosity, and crafted with natural ingredients. La Mer’s journey began when Dr. Max Huber suffered burns in an experiment gone awry and set out to create his own destiny. He hoped to unlock the healing power of the sea he held so dear. Inspired by the oceanic world, Huber fermented nutrient-rich sea kelp with other natural ingredients. 12 years and 6,000 experiments later, Crème de la Mer was born – and Huber’s skin visibly restored. 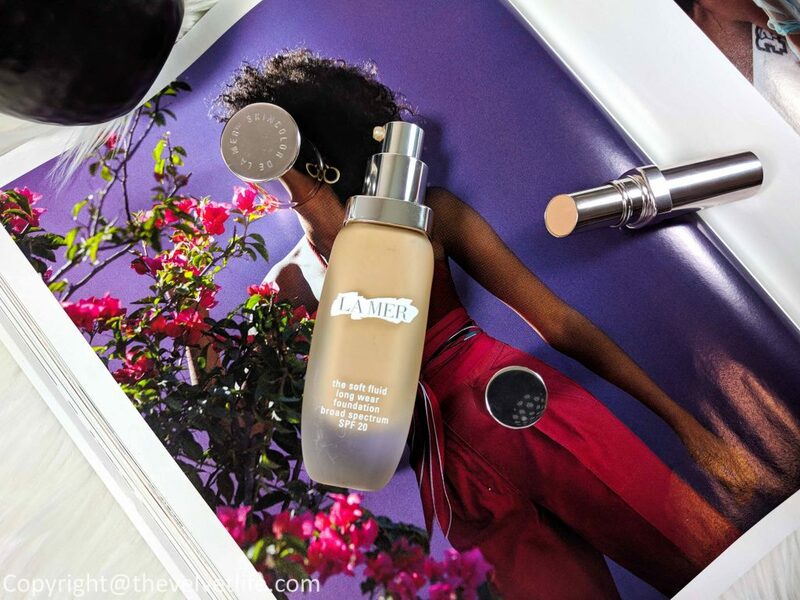 I have been using The Soft Fluid Long Wear Foundation SPF20 and The Concealer from Skincolor de la mer since last few weeks and have been impressed by the products. The Soft Fluid Long Wear Foundation SPF20 is described as a weightless foundation with luxurious long-wear texture. The Soft Fluid Long Wear Foundation SPF 20 seamlessly blends soft color, healing hydration, and Miracle Broth. Pores look refined. Imperfections virtually disappear. SPF and antioxidants help protect a newly flawless complexion. New color capsule technology helps color stay true – even in humidity. The foundation has a beautiful texture, creamy and very easy to blend. It seamlessly blends into the skin like a second skin. 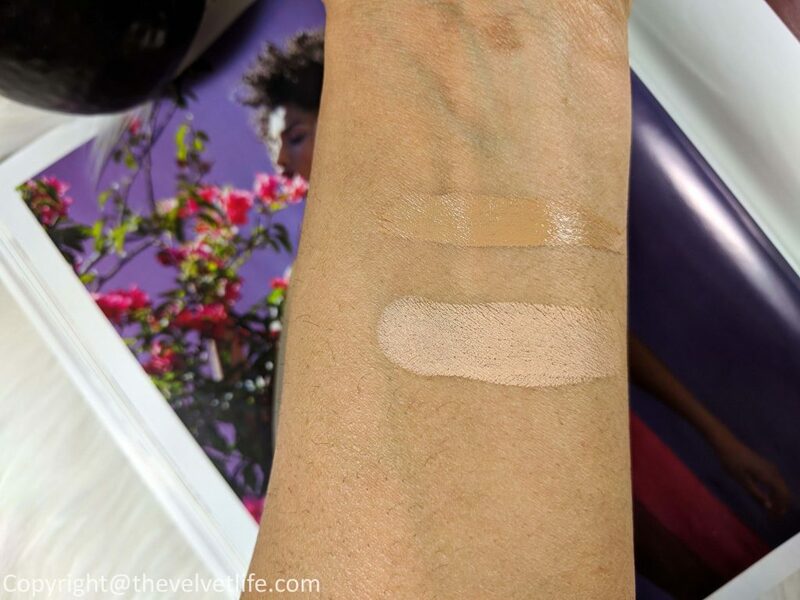 The pigmentation is good enough to give medium to full coverage. It smoothens out the pores and evens out the skin. After using it regularly, I do feel it benefits my skin like my skin is radiant, hydrated, and healthy. It does not accentuate my dry area on the combination skin. The staying power is really good, it stays flawless for over 8 to 10 hours as experienced by me. I do want to mention that the foundation does have fragrance, it does smell like the formulation or the SPF, definitely not like the separate fragrance added to products. The good thing is it does not linger around for long, fades away pretty quickly. The SPF is an added plus as I do tend to skip my sunscreen in winters when I am using this foundation. The foundation does not oxidize and stays true to the color all day. 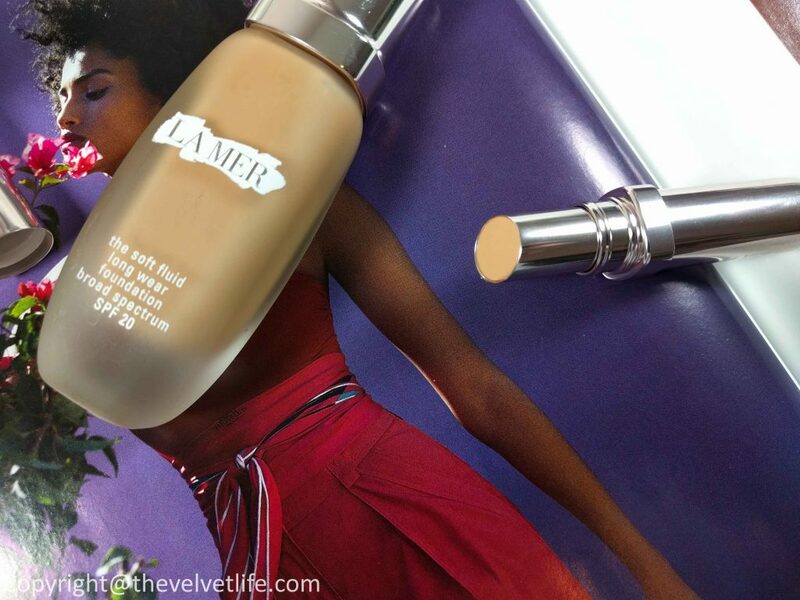 The packaging of the foundation is in the luxurious frosted heavyweight glass bottle with a pump. One and a half pump is enough to cover my face and to build upon the problem areas and evening out on the neck. The finish is satiny and looks very natural on the skin. It does not look cakey or rolls off during the day., It works great with or without primer and can be applied using fingers, brush, or beauty blender. This foundation is available in 15 shades. The Concealer is described as an ultra-creamy concealer, with the potent miracle broth, that melts into the skin with a veil of weightless coverage, youth-boosting benefits, and antioxidants. Imperfections appear blended away as the skin is treated and looks transformed. This treatment-powered concealer hugs contours, for long-wearing, buildable coverage. The concealer is packaged in a stick shape and is very easy to apply, either straight from the bullet or with brush or finger. The texture is thick and creamy, blending does take effort. Being thick, the concealer does not feel heavy on the skin but it dries pretty quickly, so it needs to be blended fast. I have used it on my imperfections to cover up the spots and pigmentation. The concealer is available in 4 shades. It has very good coverage. It does not settle into the lines or problem areas. The finish is satin like and looks natural on the skin. It does not looks cakey or fades during the day, stays well all the day for over 8 hours. Overall, I am really impressed by the foundation and concealer. I would highly recommend the foundation if you are looking for a naturally flawless luminous look that looks like a second skin, it is a must-have. 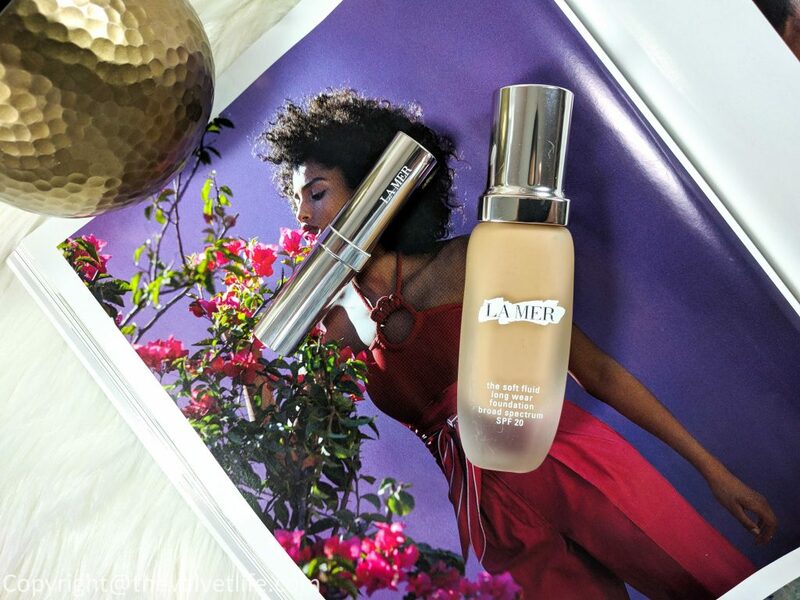 La Mer The Soft Fluid Long Wear Foundation SPF20 and The Concealer are available at Sephora Canada, Nordstrom, and Net-A-Porter. *DISCLAIMER – These are press samples sent to ‘The Velvet Life’, all views and opinions are 100% honest and based purely on my own experience. Hair care and hair health need the most care in the winter months and Christophe Robin is a brand which has been in my favorite’s list when my hair is in need of some extra care and love. I have reviewed Christophe Robin Regenerating Mask with Rare Prickly Pear Oil here which I have already repurchased and on the second jar. Another pair is the newly launched hydrating shampoo and leave-in condition with aloe vera reviewed here. They have been keeping my hair and scalp healthy. With hair fall and medium fine here, there is always that lack of volume which I am trying to create with various products, sometimes which are a hit or a miss. 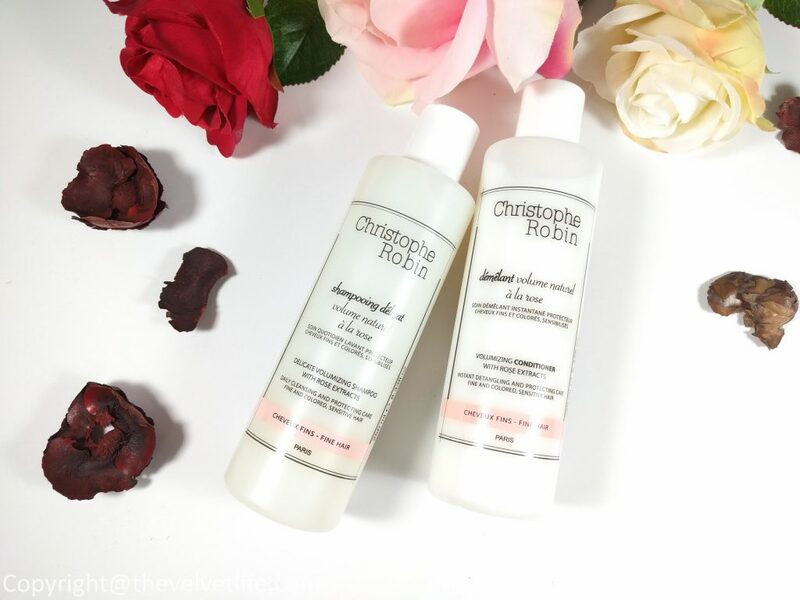 I am using the products from the collection of natural volume treatments with rose extracts to create that Voluminous hair with Christophe Robin. I will first start with why this line is different from other products aiming at providing volume as well as suitable for colored hair. Volume-enhancing styling products, shampoos, and conditioners are often boosted with alcohol or volumizing ingredients that produce instant results but prevent hair color from lasting. They can even cause the color to fade and pigments to turn very quickly. The expectations for volume-enhancing results are incredibly high, and choices must be made between treating the hair and protecting the color to strike the right balance. 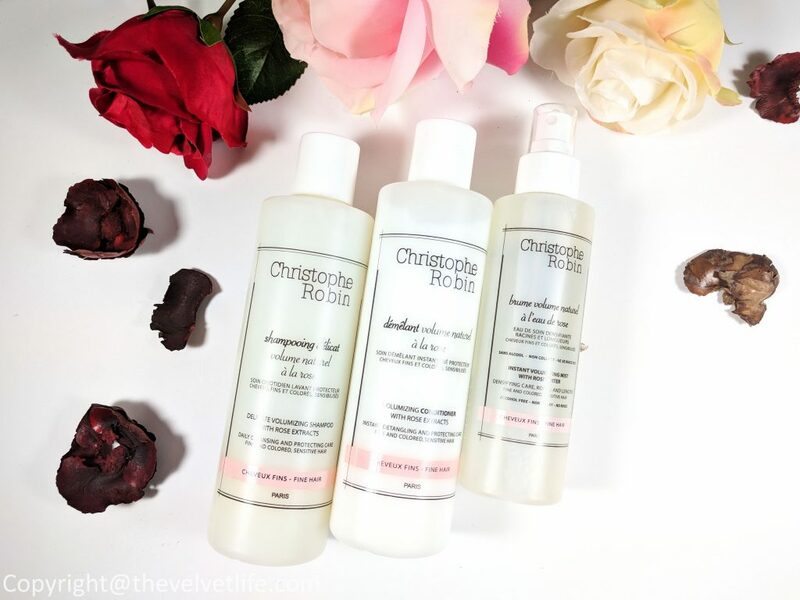 The volume and treatment products with the rose extract from Christophe Robin were developed to address the needs of women who want to maintain their fine, colored hair while still enjoying long-lasting color. These products are formulated around 3 rose extracts which help soothe scalp that is sensitized by hair coloring, they repair hair while preserving the look of fresh color, and they provide long-lasting natural volume without drying hair or leaving them dull. The 3 natural rose extracts include Rosehip seed oil which is extremely rich in essential fatty acids, rosa centifolia water which has slightly astringent, moisturizing, and soothing properties, and Rosa Gallica Glycerin extract which provide repairing and nourishing properties. Delicate Volumizing Shampoo with Rose Extracts is described as the daily cleansing and protecting care for fine and colored, sensitive hair. The shampoo has a gel formula which glides over the hair and produces a very light lather upon application. It is enriched with rose water, and fortifying baobab leaf extract which helps preserve color, repairs, and smoothes the hair while adding volume. The antioxidant ingredients, rose oil and glycerin extract, combine with an acidic pH of 4.9 to close the hair scales, preventing pigments from leaching out and keeping the color vivid and glossy. The shampoo has been very gently on my itchy problem scalp and medium wavy dry hair. The hair appears fuller and more toned since I am using this shampoo. The volume does stay on and the styling is easy. The packaging is in sturdy plastic bottles which looks very elegant. The shampoo has a subtle rose fragrance which is very beautiful and stays on for some time. Delicate Volumizing Conditioner with Rose Extracts is described to give instant detangling and protecting care for fine and colored, sensitive hair. The conditioner works with Delicate Volumizing Shampoo with Rose Extracts to aid in detangling and boost the sculpting, restructuring effect. The formula is enriched with rose water and fortifying baobab leaf extract which helps fine, colored hair feeling light and volumized, with natural hold. Antioxidants in the form of rose oil and glycerin extract, combined with vitamins A and E, help to nourish hair and maintain the color without weighing the hair down. I have been using this conditioner mainly on the ends and lengths of my hair avoiding roots. My hair is smooth and moisturized after rinsing it off and drying. The hair looks healthy with some extra volume that stays. Instant Volumising Mist with Rose Water is described as a densifying care for roots and lengths for fine and colored, sensitive hair. It is alcohol-free, non-sticky, and leave in. This hair mist is composed of 96% rose water, offering softening and soothing benefits for the scalp, which is often irritated by color or by other external factors. I apply it first on the scalp by rubbing it gently into it and then spraying over the entire head of hair to provide natural hold right from the roots, for volume and long-lasting style. 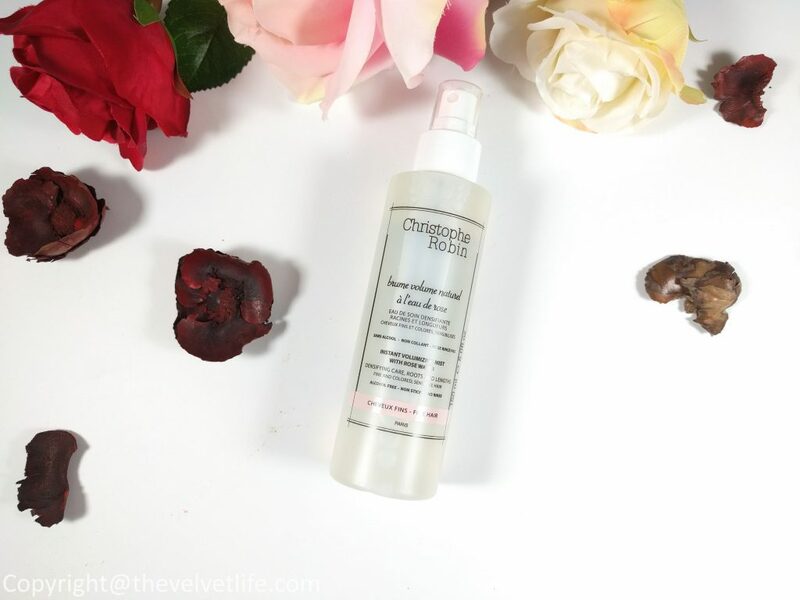 The natural rose extract in this hair mist prevents color from oxidizing. The hair mist has a subtle fragrance which amazingly uplifts the mood and feels very gentle on the hair and scalp. It can be used with damp or dry hair, roots, and lengths before styling. I have not experienced any weighing down or sticky-ness with this hair mist, I have used this to freshen up my hair between the washes. Overall, a beautiful line with nice products to give volume to fine hair and also if you are looking for something that is natural, maintains the vivid color of your hair, does not irritates your scalp or fades your color, I would highly recommend you to check these out. Delicate Volumizing Shampoo with Rose Extract, Delicate Volumizing Conditioner with Rose Extracts, and Instant Volumising Mist with Rose Water are available at Sephora Canada, Net-A-Porter, Nordstrom, SpaceNK UK, SpaceNK USA, and Sephora.